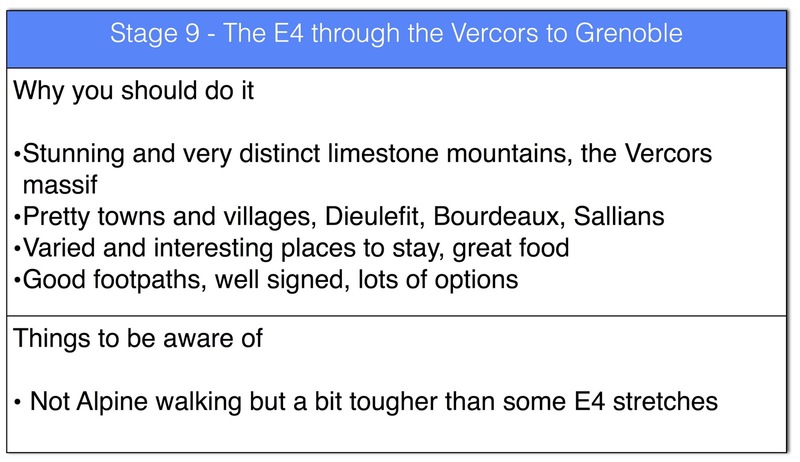 Although you're walking through mountains for almost of the French part of the E4 it's not all the same. Crossing the Rhone in particular meant I was leaving one type of geology and geomorphology, the ancient and fairly gentle Massif Central, and moving into another type which was younger and fresher. I was now moving into the Vercors, essentially the western foothills of the Alps. The Vercors, like a lot of the Massif Central, is limestone but here the uplifts have been relatively recent and as a consequence the erosion and the resulting cliffs are more dramatic, a little bit like their cousins in the Dolomites but of course with a different colour. From Leoncel onwards the walk takes you through the Vercors Natural Park where the mountains form what has been described as a limestone "citadel", a huge upland massif with deep gorges sliced out by the rivers. The term citadel, of course came to have a more literal meaning in the Second World War. The Germans had always struggled to dominate the region and, just before the Normandy invasion, the Resistance embarked on their most ambitious action against the German army. In repressing the action the Germans were forced to deploy 10,000 paratroopers, landing by glider and killing some 600 maquisards. Crossing the citadel meant tougher walking, 219 kilometres in 8 days with an average daily climb of 1,000 metres. Navigationally it was straightforward - I was now on the GR9 and the route followed the GR9 all the way to Grenoble and then on from Grenoble to the Swiss border. As well as my GPS trail downloaded from GR-Info I'd also got an up-to-date Topoguide. I was on my own again and all I had to do was walk. First day was a tough one, 40 kilometres and 900 metres of climb to Dieulefit. I was still in the Rhone Valley and had to finish crossing the main north/south transport corridor by going over the Autoroute de Soleil and under the TGV line before a gentle climb up into the hills and onto the Trappist Monastery at Aiguebelle. Mainly shrubby forest it's gentle until the climb up to Mont Rachas (950 metres) after which the route takes you down steeply to Dieulefit (having left the GR429 and joined the GR9). The hotel I stayed in was OK but involved a long walk out of town, there is a much more convenient one in the middle but it was fully booked. It was short walk the next day which was lucky because it was pouring with rain in the morning and a late start kept me dry. Very pleasant walk to the pretty town of Bourdeaux. I went past the stunning Romanesque church near Les Lombards, perfectly positioned on a hill, and a ruined castle just before the town. Accommodation was provided in a Chambre d'Hote, at the excellent La Tulipe Sauvage. The dramatic walk came the next day. After stocking up at the market in Bourdeaux I followed the route up the mountain towards Rocher de la Laveus. Brilliant views back to Bourdeaux with the castle dominating the town. Arrived at the top of the Rocher de la Laveus in the sun, huge limestone cliffs with great views north towards Sallians. With hindsight I should have taken the variant up to Le Veyou which would have give me even more of this amazing walk along the cliff before rejoining the GR9. It's then a steep climb down to Sallians, a lovely town with lots a accommodation. I stayed at the town's Gite D'Etape, a bit primitive but good food and good value. Great walk but I wish I had done the variant. Such walking couldn't be sustained and the next day was a little dull in comparison. The first half to Beaufort sur Gervanne was through scrubby forest across a sandy undulating moraine, not bad but not brilliant. The second half was much better, a climb up to the Rocher de la Laveuse and then a lovely walk along a ridge before dropping down to the little village of la Vacherie. I stayed in another Gite D'Etape, a huge one but I was the only person there - good food and a charming host. Better again next day, although the weather was a bit dull. Really cold north wind blowing straight down the lovely upland valley which hosts the villages of la Vacherie and, further up Leoncel. The cliffs get higher as you head north but dense trees means that open views are fairly rare. Walking firstly on the east side you then cross the valley and climb nearly to top of ridge at Rocher d'Aiguille (1100 metres) before dropping down into another valley heading east valley. At the bottom of this valley you then walk through a really pretty gorge, barely mentioned on the maps, before climbing up again to the village of Bouvante-le-Bas where I stayed at the slightly down at heel Hotel Sapin. The GR9 is now taking you into the heart of the Vercors and the sense of citadel really comes through. Firstly a big 800 metre climb up from Bouvante-le-Bas to the top of ridge. The weather was good but the density of the trees hid the views and indeed on the other side of the 1300 metre col you were in middle of commercial forest and had to walk along horrible tracked forest access roads. The route then goes down to the Col de la Machine, a bikers paradise, the views improved but you still felt short changed given the climb. I then took the GR9 variant down into the gorge with the village of Laval at the bottom, a huge open gorge with 700 metre cliffs, fantastic. Out of the gorge the GR9 takes you along the foot of the cliffs, with the plain to the west, and views into more gorges carved out of the Vercors massif to the east. Pont-en-Royan sits at the entrance to one of these gorges, a pretty town in a very pretty location. Stayed at the Hotel Royans, cheap and cheerful. The next stretch takes up the gorge to the east of Pont-en-Royans, firstly along the Gorge de la Bourne, and then, after climbing steeply up its side, along a valley running north south to Rencurel. Very dramatic and very interesting. The second valley, to the north of the Gorge de la Bourne, repeats itself on the south side (with huge wave like mountains running along its eastern edge) and this north-south valley must be a remnant an earlier uplift of the Vercors. Absolutely brilliant scenery. Only downside was that the Hotel le Marrionnier in Rencurel was full and I had to stay back down the valley in La Balme de Rencurel, a nice hotel, just out of the way. On my last day in the Vercors I walked all the way to Grenoble. This was a mad thing to do but I was making good time and I just couldn't bring myself to walk back to Autrans which provides the sensible accommodation option. 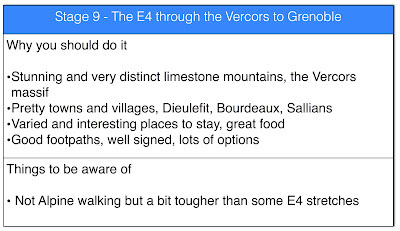 The GR9 takes you up the Rencurel valley and then up onto a ridge running north south. The ridge then merges into cliffs formed by a giant meander in River Isere, huge cliffs which face north to Moirans and then east to Grenoble. The walk takes you the all way around this semi-circle of cliffs. It was misty when I started but once this had cleared the views were absolutely amazing and when the time to head back to Autrans I just couldn't do it. Instead I carried on walking, firstly down to Engins and then up over another ridge to ski resort of St-Nizier-du-Moucherotte, and then an knee crunching descent down to Grenoble. Fantastic two days walking done in a day. Was eating street pizza in Grenoble at 9 o'clock, about 13 hours non-stop walking. Gorgeous pictures. The building in Pont-en-Royans is fantastic, and with the water like a mirror it looks even higher. Is that a portal under the yellow house? What's behind? I only see the rock wall behind...? Good luck with further adventures and take care! Eva - thanks for your kind comments, I think I was able to walk so far because I didn't know how far it was when I started. Because I now know how far it is I wouldn't be able to do it again! Behind the house is a lovely old street which leads up to a very pretty bridge which you can just see on the right. The walk then carries on up along the street into an enormous and very dramatic gorge. Like you blog by the way.